Nursery – is sometimes available for Sunday morning Worship services. Children’s Church – Sunday morning during 11:00am Worship Service, children ages 2 - Kindergarten. Youth Group – Sunday evenings at 6:30, 7th - 12th grade. Christian Preschool – we have classes for 3 and 4/5 year olds that meet two to three days per week. Adult Sunday School Classes – Sunday mornings at 10:00am. Weekday Bible Study - Thursdays at 6:00pm. Choir and Handbell Choir – Thursday rehearsals are at 7:00pm (choir) and 6:00pm (handbells). Ladies Lunch Bunch – 2nd Tuesday of each month at 12:00pm. Food Cupboard – 1st and 3rd Mondays of each month at 6:30-7:30pm. Contact the church office for additional information. Mt. Chestnut Senior Center – Monday and Thursday mornings at 10:00am for all Seniors (games, meetings, Bible study, lunch). Girl Scouts & Brownie Troops – as requested. Families of Addiction – support group meets each Tuesday at 7:00pm (Hope For Broken Hearts - H4BH). God is ALWAYS about doing something new. My name is Ron Schermerhorn. I came to Mount Chestnut in June of 2017. It has been such a great blessing for us to be a part of such a wonderful group of people. This picture was taken when I was in Israel in 2016. It was taken in Bethlehem at the house of a wonderful man and his wife. They were directors and founders of a wonderful ministry to young people who were mentally challenged. They were an older couple who had given themselves for these young people. This had a great effect on me, as I spent three days with them. Their love for each other, their love for the children and teenagers they work with every day, and their love for God and doing God's work there in Bethlehem deeply touched my heart. I have grown to appreciate God's love when I see it in other people. The Mount Chestnut Presbyterian Church is a solid group of people who genuinely love God and each other. It is a great privilege for me to pastor such a loving, caring and growing congregation. It is a church filled with a wonderful spirit, open to God's direction. God called me into ministry in high school. God has been faithful all the way to this date. I grew up in the Church of the Nazarene. It is a different denomination in the holiness tradition. I felt God's leading to follow a reformed tradition, as reformed theology seemed to fit my understanding of who God is and how He is working in the world today, and in the lives of Christians. After spending 17 years in pastoral ministry, I felt God's leading to work in the hospice field as a chaplain. I spent nearly 10 years in this challenging ministry. It was an amazing time of growth for me, as I spoke with folks about their relationship with Christ, and God's love for them through the darkest days of their lives. I reentered pastoral care in January of 2015 in a temporary pastor position as I transferred my ordination into the PCUSA. God's doing some great things at MCPC! I am looking forward to working with these amazing people for many many years. My catch-phrase is "God's got this!". Need to know more about us? Our services are Sunday mornings at 8:45 and 11:00. I would love to meet you personally. Every service is a new experience of God's presence. Come and join us! He still sings with the Bogmeisters in Cranberry today! Their next concert is March 5th. The Mt. Chestnut Presbyterian Church is part of the Beaver-Butler Presbytery which consists of Presbyterian churches in Beaver and Butler County areas of Pennsylvania. Our church is governed by 12 Elders and one Pastor/Moderator along with many members of the church community that form the committees in the church. Since 1858 the faithful people of Mt. Chestnut Presbyterian Church have been striving to keep God’s commandment of spreading the gospel of Jesus Christ to our community, and to the world through our various programs, groups and outreach ministries. Because of the faith, strength and determination of our predecessors we are blessed with ample spiritual resources. In 1850 the land on which the original church building stands was surveyed and hence the beginning of the history of the Mt. Chestnut Church. 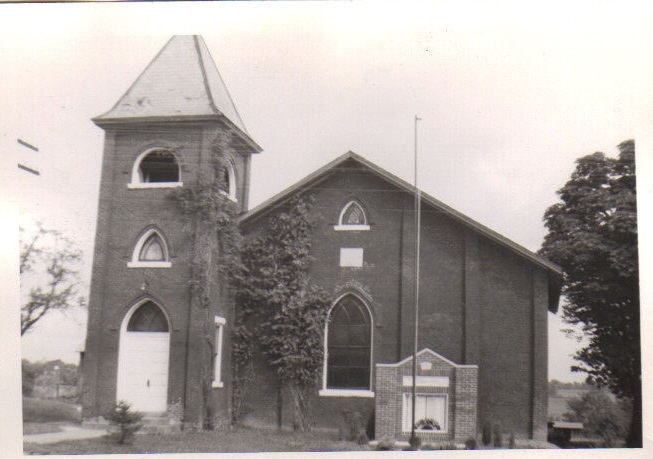 The congregation was organized in 1857 by Rev. William Brandon as a part of the Associate Reformed Presbyterian Church. The congregation made and laid the bricks for a 40 x 45 foot building on Route 422 and then paid a carpenter $490.29 to finish the work. The membership grew rapidly and by 1862 there were about 100 members. Over the next 130 years the congregation underwent a lot of changes including 18 ministers called to Mt. Chestnut. The membership saw its normal periods of growth and periods of decline as is common in any church history. The work of the Holy Spirit has always been evident in the works of this church family. The membership had increased dramatically and so did attendance of worship, Sunday School and small groups. In the early 1980’s we had physically outgrown our building and surrounding property so plans were drawn up, property was acquired and the work began on a new modern church building. On Christmas Eve 1987, the Mt. Chestnut congregation worshiped and celebrated the nativity of our Lord in the present new church building, 727 West Old Route 422, Butler, PA 16001. Today the church enjoys an outstanding music program, and we have established a Christian Preschool and Food Cupboard, along with other new groups and programs. Our building is used in the community by AA & Al-Anon, Girl Scout troops, a Senior Citizens Center, a Township Polling Place, and many others. The congregation serves in a community that is a rural, agricultural area which is experiencing subtle growth. The area is community oriented and “small town” friendly. Although we have experienced steady growth in the congregation we have still maintained our small church friendliness. The Mt. Chestnut congregation strives to welcome and embrace with a Christ-like love all who enter here. The Mt. Chestnut congregation continues to be Spirit directed, forward looking, and community and mission minded, helping people to live in God’s love, for which we give all praise and glory to God!